Fantastic book. If you commit a massive, white-collar crime, but you’ve got enough (i.e. near-infinite) cash, you’re now too much trouble and risk to even indict, let alone prosecute. Unless you have been living under a rock you have watched all the protests on television. This discontent started to bubble to the surface with Trayvon Martin even though George Zimmeman was not a cop. His acquittal was seen as a betrayal of the justice system for many. Organizers of Millions March NYC demanded justice for 18-year-old Michael Brown in Ferguson, Missouri, Staten Island father Eric Garner, who died last July after an NYPD officer put him in a chokehold, and Akai Gurley, the unarmed man fatally shot by police in a stairwell. Sites like Killed by the Police and Fatal Encounters have been created because there is no national database on the number of people killed by police in the U.S. At least not an accurate one. But this is actually a far bigger issue. It goes way beyond the number of people killed by police or targeting black Americans. There is a mutual distrust and some would even say hatred between the police and the public they serve and this is a powder keg; not to mention bad for the public and the police. All these protests are a manifestation that real reform is long overdue and very much needed. All of those examples above are symptoms of this larger issue as police are now have hair trigger responses. In this article I want to opine what I personally feel are some of the causes for this fear and distrust as well as to offer my own suggestions for improvements in part 2. I also welcome your own thoughts in the comments and may decide to add them to this article. People can and have written books on this question. I do not plan to write a book and simply want to list a few reasons I personally feel that have caused our disconnect. 1) The Failed War on Drugs – Eccentric billionaire Richard Branson wrote a very good op-ed piece which explains why this war has failed and why we should shut it down. This more than possibly anything else has caused more damage and lives lost or ruined than anything else both in the U.S. and Latin America. We lost this war a long time ago, so let’s end it. Treat addicts like patients not criminals. It is time to end this tragic war once and for all. 2) Civil Asset Forfeiture – This is actually part of the war of drugs but I thought it merited a separate mention. This encourages police to act recklessly with no-knock warrants like the one used to kill David Hooks who was innocent. Policing for profit encourages corrupt and bad cops and this must be stopped. It also encourages harassment of innocent citizens and outright stealing from police. It has to stop or at least be reformed for example by turning over all seized assets to our school system for example. 3) Ticketing Quotas – This is a very well-known open secret. Ticket quotas are the minimal number of tickets to be issued by a law enforcement officer for issuing parking tickets, stopping people for moving violations, issuing quality of life summonses and even for making arrests. Some police departments set “productivity goals” but deny specific quotas. This is entirely revenue driven and results in distrust and anger directed at cops. In defense of the police officers I would add that most would like to stop having these quotas and are against it. It is the chiefs that are responsible for this as a source of revenue. 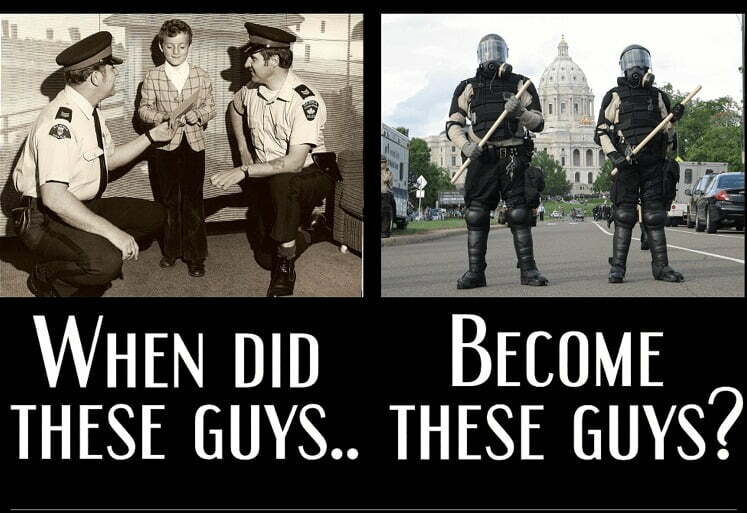 4) Police Attitudes – Police officers act like they’re in a war zone, forgetting they face citizens, not enemies. 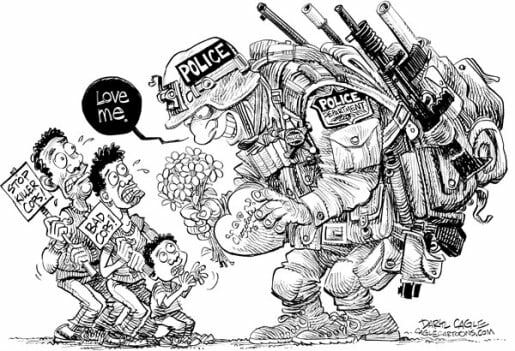 But blurring the lines between civilian policing and military action is dangerous, because soldiers and police have fundamentally different roles. 5) Grand Jury is Broken -From City Hall to the White House, officials pledged to consider sweeping reforms after a grand jury refused to indict a white NYPD cop in the chokehold death of a black Staten Island man, Eric Garner. Rarely does a Grand Jury ever indict a cop no matter what the evidence and circumstances dictate. We need a better way. 6) Police Brutality Is Systemic, Not Anecdotal – police misconduct has become a fixture of the news cycle. 7) For Profit Prison System – Private prison companies, however, essentially admit that their business model depends on locking up more and more people. For example, in a 2010 Annual Report filed with the Securities and Exchange Commission, Corrections Corporation of America (CCA) stated: “The demand for our facilities and services could be adversely affected by . . . leniency in conviction or parole standards and sentencing practices . . . .” As incarceration rates skyrocket, the private prison industry expands at exponential rates, holding ever more people in its prisons and jails, and generating massive profits. 8) U.S. Incarceration Rate – The United States is the world’s leader in incarceration with 2.2 million people currently in the nation’s prisons or jails — a 500% increase over the past thirty years even as crime rates have gone down. Other wealthier countries lock up far fewer people but are far safer as a whole. People locked up for non-violent crimes often graduate from Prison U as actual and well-trained criminals where they weren’t before. We are spending trillions educating and training non-violent people to become hardened and violent criminals. 9) The poor and middle classes are easier targets for police than the wealthy- You rarely hear a case where a no-knock warrant is issued and they break down doors in the middle of the night in wealthy neighborhoods. Most Americans believe that the police disproportionately target people of lower incomes while the rich receive a velvet glove treatment. The poor lack the funds for high powered attorneys so they are much more vulnerable to police abuses since they are less able and likely to fight back in court or file complaints. 10) Filing a complaint against police can be an uphill battle – Many police agencies make filing an official complaint arduos and complicated. issues ranging from a lack of complaint forms, to threats of intimidation or prosecution of those who wish to bring complaints. We need statewide standards to ensure that those with complaints about misconduct will not be turned away, intimidated or silenced. A good guide to writing one can be found here. 11) U.S. Cops kill at 100 times rate of other 1st world countries – From 2010 through 2014, there were five fatal police shootings in England, which has a population of about 52 million. By contrast, Albuquerque, N.M., with a population 1 percent of England’s, had 26 fatal police shootings in that same time period! 12) Hair Trigger SWAT and Drug Teams – overzealous, militarized, hair trigger SWAT teams, itching to go on a raid, often called in from bogus reports from sick individuals looking for a rush or thrill. They file a false report of gunfire or similar and then the SWAT can swarm in on innocent people just playing a video game or kill an innocent man like David Hook. Unless there is a hostage involved there is no need to invade a home without serving a warrant and knocking. 13) Pervasive police corruption – Police do not receive huge salaries. Accepting bribes in exchange for not reporting organized drug or prostitution rings or other illegal activities is not uncommon. Much more needs to be done to root out corrupt cops on the take. 14) The Need for Community Policing- Police drive around in patrol cars and rarely speak to people unless they report a crime or are a suspect in a crime. In cities and countries where police patrol on foot, bicycles, segways, or have small stations in neighborhoods or a program in place to allow the police and public to interact on friendly terms they can become neighbors and not invaders. 15) Blue wall of Silence– Good Cops Need Protection for speaking up. An unwritten rule exists among police that officers not report on a colleague’s errors, misconducts, or crimes. This mentality has to change to weed the force of the cancer of bad cops. 16) Unfair Sentencing– Steal millions on Wall Street? No jail for you. Get caught with some marijuana in your pocket? Jail, possibly a felony arrest record and you become unemployable and your life is ruined. If you’ve wondered why none of the people who committed these global frauds on a massive scale have ever been prosecuted for any of it, this book gives you a detailed, compelling, and depressing answer. It also documents how miserably the system treats the disadvantaged. What you think you know from “Law And Order”, believe it: you don’t. Kafka himself couldn’t improve on some of this. At one point Taibbi refers to all this as a “descent into madness.” And after reading it, it’s hard to argue with that. As I said before this is not a comprehensive list and I welcome your own suggestions in the comments below. These are simply the ones that came to the top of my head as to what I consider areas that need major reforms or repeal. I am not anti-cop in the least and I understand the hard job they are required to do. I also know of so many good cops that are just as upset as the rest of us by all these examples where bad cops can tarnish all the hard work they have done to change perceptions. Many of my reasons above in fact have nothing to do with the police but more to do with politicians and bad laws that the police have to uphold even if they also think the laws are wrong or bad. I recently wrote an article about a tactic of arresting someone for resisting arrest when there was no actual reason the person should have ever been arrested in the first place. Part of the reason for these tactics is the police are just as afraid of us as we are of them so often operate on a hair trigger. This simply has to change. In other countries like those in Europe, Japan, Korea, and several more you do not have this “disconnect” for lack of a better word between the police and the public. Even in the U.S. you did not see this level of distrust and fear decades ago to this extent. We simply must figure out a way to improve the relationship between our men and women in uniform and the people they are sworn to serve and protect. If ever there was a case for couples counseling it is the relationship between the police and the public. In part 2 I will make a few suggestions to improve this relationship. Do you have any other suggestions I missed? Leave them in the comments below and I may edit and add them to my list. Try and be succinct and include a good link for support. The shooting that happen at the Pio Nono Ave. Kroger here in Macon still leaves unanswered questions in my mind……just saying. The police officer involved is the reason why…………..such a questionable record. I’m not familiar with that story. Can you paste a link to it or provide more details?